Congratulations! You have journeyed through the 4 steps of our Strategic Planning Process and you’re ready for the final step: Create. (We covered step 1, step 2, and step 3 in previous blogs). The goal of a strategic plan is to develop timely, relevant and action-oriented plans for the future of your organization. Once you have a clear direction, it is time to make sense of the information and package it in a way that is meaningful and possible to implement. At TCG, we believe a strategic plan has little value if it is a report that sits on your shelf, never to be seen again. We don’t create long strategic plan reports that you can’t use. We want you to use it, share it and review it on a regular basis. 1. 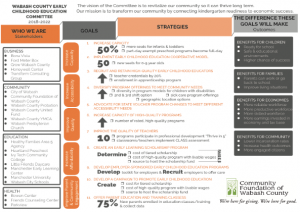 One-page strategic plan – This is a one-page summary of your goals and top strategies. This tool can be shared externally with partners, funders, and other key stakeholders as well as internally with staff. Each one-pager for the strategic plan that we create is unique to the client but essentially covers their top goals and strategies. 2. 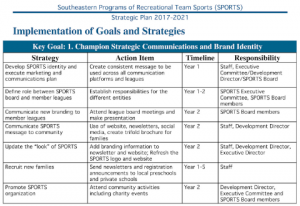 Strategic plan report – This report explains the process of how the strategic plan was completed, the information that was collected, and more details about the goals and strategies. This is typically an internal document that is shared with staff and the board to use when reflecting on the process. It’s especially helpful to document this information for when there are leadership transitions with the staff and board. 3. Implementation plan – Too often we find that organizations get stuck with figuring out how to take the big picture elements in the strategic plan and make them operational. We create an “implementation plan” to unpack the strategic plan into actionable steps for staff, committees and the board. The main audience for the implementation plan is staff, board and committee members who are most likely responsible for implementation. This could be set up like a calendar or a chart that describes who is responsible for each step. We also love using Tableau to create a strategic plan dashboard to track and monitor action items and milestones. The point is that we want all parties involved to have a clear understanding of the timeline, so that they can put the plan in motion. Is your organization ready to jump into a strategic planning process? Learn more about our strategic planning services here. Contact us today, and we’d love to chat about how our team can meet your needs. We are continuing our blog series on strategic planning by focusing on Step 3 of our 4 Step Strategic Planning Process: Facilitate Consensus. Read more about our previous strategic planning blogs in this series here, here, and here. The main purpose of this third step is for the strategic planning team to start to reach agreement about the future direction. Organizations will often form strategic planning committees or task leadership teams to complete their strategic plan. This means that different types of people with various perspectives and insights will have to learn to work together on a common goal. We actually encourage collaboration and engagement in the strategic planning process and discuss it more Step 1 in this blog. Issue Homework – Prepare a packet of information that summarizes all of the data and information that has been collected. Most likely there will be some important information that would be helpful for the group to read in advance of coming together. We like to package that information into a “pre-read” report or slide deck presentation (see more here). Host Planning Sessions – Set aside time for the planning team to come back together once all of the information has been gathered. Depending on your planning team’s availability, this may need to be broken out into a couple of sessions. Facilitate Group Discussion – If your budget allows, it is very helpful to have a consultant (ahem, TCG!) facilitate your planning discussions. This way all members of your team will be able to engage in the discussion. They are also equipped with adult learning strategies and can design a highly engaging and interactive process for your team. 4. Focus on the “What” First – We often see many planning team members who want to jump into the strategies and problem-solve the needs/ gaps identified. The first step in consensus building is to reach agreement on the “What” you want to accomplish. We call this setting your big goals and top areas of focus. We also try to limit our clients to 3-5 big goals/ focus areas. Once you have this set, then you can get into the “How” you will accomplish your goals through strategies. 5. Take the Temperature – As you are moving through this process, it is important to check in with your planning team at these meetings and maybe even afterwards. You want your planning team to be confident in the agreements that have been made and to not have any ill feelings of team members. While not everyone may get what they think is important, everyone should be in collective agreement about the plan. During these planning sessions, your consultant or team lead should check the non-verbal and verbal cues of team members throughout the process and respond as needed. By the end of step 3, facilitating consensus, your team should feel excitement and enthusiasm about the possibilities for the future and the plan! If not, that might be indicator that the consensus is not there with the whole group. In that case, you may need to come back together and have an honest discussion. A strategic plan is not something to take lightly or go through the motions. It can set the path for the future of an organization and help bring about transformational change. When you take the time and effort to follow these five recommendations, your organization will be on its way. If you are ready to start your strategic plan, contact us. We would love to support organization’s strategic planning needs. There are amazing organizations working hard to support the development and achievements of young children. Similarly, there are outstanding organizations working hard to connect adults with proper resources to attain success. It might seem like supporting each of those populations separately would naturally complement the other. However, a recent reflection on this topic has shown that intentionally supporting the development and personal growth of the children and adults together (a two-generational approach) can have a larger, positive impact for both generations. 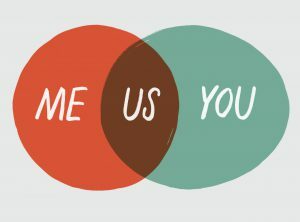 By working simultaneously together, it ensures that programs and services are not fragmented and therefore do not leave either the child(ren) or adult(s) behind. Research has documented the impact of a parent’s education level, financial stability, and even overall health as having a negative or positive impact on their child’s outcomes. Similarly, children’s education and healthy development have major implications for the parents. WHAT IS A TWO-GENERATIONAL APPROACH? Provide parents with multiple pathways to get family-supporting jobs. This leads to achieving financial stability. – One study found that children whose family income was below the federal poverty level — which today is about $24,000 for a family of four — completed fewer years of school, worked and earned less as adults, relied more on food assistance and suffered from poorer health than kids whose family income was at least twice that level. But an extra $3,000 annually for these families during a child’s earliest years could translate into an increase of more than 15 percent in what that same child earns as an adult. Ensure access to high-quality early childhood education and enriching elementary school experiences. – Greater coordination among early learning centers, schools and other programs for kids can further support healthy development from birth through the early elementary years. Equip parents to better support their children socially and emotionally and to advocate for their kids’ education. – When parents are able to reduce their stress and anxiety, they can better respond to their children’s emotional needs. Simply put, a two-generational approach looks at what both the parent(s) and child(ren) needs, and works to provide the necessary resources (education, healthcare, childcare, etc.) for both generations to be successful. United Way of Central Indiana (UWCI) is applying this emerging research of a two-generation approach and modeling it in their Great Families 2020 Social Innovation Fund initiative. Great Families 2020 is a five-year initiative aimed at improving family stability for vulnerable children and their parents living in four neighborhoods in Indianapolis. 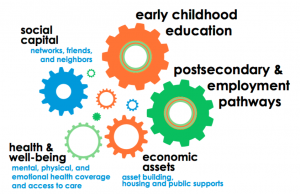 Great Families 2020 will be piloting a two-generation approach, where neighborhood networks in education (including high-quality early childhood education), financial stability (Center for Working Families), and health services are integrated to serve the whole family. Funding for this initiative consists of a federal Social Innovation Fund grant totaling $7 million and matching dollars from the community for a total investment of approximately $20.6 million. UWCI just announced their final four programs that will implement the Great Families model in their neighborhood. Our President, Amanda Lopez, was invited to help select the community grantees. Review the research. Become familiar with this approach and initiatives underway nationally and locally to stay informed. Knowledge is power! Review your current programs and funding focus. Perhaps you will see that you have fragmented services that are missing that other generation. Can you partner with other agencies to accelerate the accomplishment of your goals? Can you apply for funding that supports a two-generation approach? Reach out. Sometimes the best way to reflect on opportunities for growth is to connect with organizations that are successfully modeling your ideal funding stream/program/outreach strategy, etc. So use the research you will do to connect with organizations that are successfully using a two-generation approach to achieve greater impact to hear how they are doing it. At Transform Consulting Group, our clients are working with both populations: young children and their parents. We are helping our clients increase their partnerships internally within their organization or externally with other partners to improve outcomes for children and parents. If you are interested in learning more about two-generation approaches or funding opportunities to support your work, please contact us for a free consultation! As a small business owner, I have the opportunity to hire new team members. I did not take any courses in college or graduate school that taught me how to hire staff. (Sidebar, I did not even know I was going to be a business owner back then!) 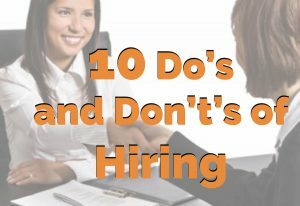 However, over the past several years I learned some key strategies on what to do and what not to do when hiring. Do: Before you even start the application process, you have to have a clear understanding of your organization’s needs and how this role will fill the gap. If you are replacing an exiting employee, do you want your new hire to have the same skill set? Is your organization going in a new direction, and you want your new hire to have a set of skills to support that new direction? This type of analysis should help inform any revisions to the job posting and the questions you ask during the interview. Don’t: Use only the standard methods of sharing the job posting. Know your audience and market to determine the best methods and platforms to share the job opening. For some organizations, it makes sense to post ads in the local newspaper. For others, posts on social media platforms and trade associations works better. At TCG, we use a mixed-methods approach of paying a nominal fee to post with a trade association for nonprofit organizations, announcing it in our electronic newsletter and sharing across our social media platforms. Keep an eye on your response rate, and be willing to adjust your methods to get the results needed. Do: Think beyond the content skills you are seeking to the soft skills necessary to be successful in your organization. Our staff must be sharp and also have the disposition to work collaboratively internally with their team and externally with our clients. Therefore, we need team members who have the “smarts” and are also great communicators, problem solvers and partners. Don’t: Use the standard interview and hiring process. Rethink the traditional interview process and assess how it is working for you. Are there steps that you can eliminate and still get good results? We diligently scan the best applications and only select the ones who are possible candidates to go through to the first round, which is a phone interview. After the first round, you may be able to stop here and make a decision. There’s no reason to drag on the process if you know who to hire and don’t need more information. This will save you and your team time and money. If you are still unsure, assign a “homework” task to the possible candidates. This could include a short writing sample, data viz, or blog post – whatever is relevant to the nature of the job. A “homework” assignment could be more revealing than a second interview and show how much they want the position as well as their skills in action. Do: Describe the work culture and environment that you have to offer. More and more employees are looking for a job in a work environment that they will be motivated in and thrive. Do staff work in their office by themselves all day, or is it a collaborative open space environment? Not all employees are successful in a collaborative, open environment. More and more employees want a flexible work schedule, ability to work remotely, and collaborate with staff while still working independently. Do you have a clear sense of your work environment, culture and who will and will not be a good fit? To your best ability, describe it in your job description or during the interview process. Don’t: Use the standard interview questions: Where do you see yourself in five years; What are your strengths; What are your weaknesses? The answers are often scripted and don’t really provide the insight necessary. Really think about the skills needed to perform the job and ask questions that give you the information needed. Some of my favorite interview questions include: Is it better to be perfect and late, or good and on time? ; We have to quickly learn about new industries and causes for our diverse clients. Tell me how you became informed and knowledgeable about a new issue area. What would you do differently, if anything, the next time that you needed to learn something new? ; Assume that you come to work here. One year from now you finish work one Friday evening thinking that accepting this job was the best thing you ever did. What happened during the year for you to feel that way? ; Some of our team works remotely while others work in the office. This means you could be working independently for several days a week and then meeting with a client or a team member on the other days. What experience do you have working in this type of environment and how would you be successful? Do: Be open to new possibilities. In reviewing resumes and applications, the applicant may not “fit” the part on paper, but could be great in your company. I look for skills that are transferable even if they are not in the same field or industry. I also look for increasing leadership in the projects and experiences noted. I have also learned that some more seasoned applicants are looking for career shifts and might be willing to take a pay cut to work with your organization that will help support their career shift. Others might be looking for less responsibility and more work-life balance. Don’t judge a book by its cover. Don’t: Ignore the applicants. At every step of the hiring process, it is important to follow up with all applicants. Don’t leave anyone wondering if they made it to the next round or not. I am shocked when I hear friends and colleagues share stories of interviewing for positions and then receiving no response. I understand that the interview process might take longer to make a decision, so I will check in with the applicants and let them know it is taking longer or tell them then if they are no longer being considered. I consider all potential applicants as possible clients or employees. They may not be a fit for the position today but could be in the future. They could also be a future client depending on their next job, so I want our company to be well represented throughout the interview process. Do: Say “no” when you know it is not a good fit. In general, I am a nice person and have a hard time disappointing others. For some applicants, they will convince themselves that this is their dream job, and it is hard to turn someone down. 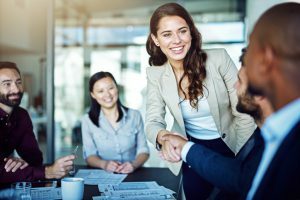 You will know almost immediately if someone is not the right fit through their application materials and the first interview. Again, I consider our hiring process an outreach opportunity to meet new individuals in the field. Therefore, I don’t want to burn any bridges, but at the same time I need to manage expectations for candidates who are not a good or right fit now. Don’t: Rush the hiring process. It can be time consuming to thoughtfully review your organization’s needs and prepare a comprehensive job description and posting. It takes significant time to read each applicant’s materials and respond to every applicant; to set up the interviews and write thoughtful interview questions; to determine the next steps in the hiring process (second interview or homework task); to follow-up with each applicant about next steps; to negotiate “win-win” offers; and to onboard new employees (which is a whole blog in itself!). However, getting the right candidate is worth it if you invest your time in the front end of the hiring process. This will hopefully result in more sustainability and productivity in your company, which is something we all want! Like I said, I never set out to be a business owner hiring employees. Now that I am in this position, I consider this an awesome responsibility and opportunity. I have learned that each team member is an extension of our organization — our mission, values and priorities. I want team members who will represent our organization well and be excited about our work. Learn more about our team and culture here and stay posted on any TCG job openings here. We love seeing our partners accelerate their impact and serve their communities in a variety of ways. However, we understand the challenges you face and know that to do good work, you need money. Grant writing is one strategy for raising funds to accelerate your organization’s impact. There are two types of grants: Foundations and Government, and both come with their benefits and challenges. Foundation grants can be community and public, private and family, or corporate. According to Giving USA, foundations gave $59.28 billion in 2016. Foundation grants are usually broad in scope. They cover a variety of causes and are offered to organizations of all sizes. These grants are usually more flexible. There is often freedom in making the grant work best for your goals and needs. Once you receive a foundation grant, you will realize how much more hands-on foundation representatives are with your organization. There is a relational aspect as you go through the process and utilize the funds. Often the application for foundation grants is less cumbersome. Foundation grants have a limited timeline. They are typically for one-year and often for smaller amounts. Foundation grants are more relationship-oriented as noted above, which can be a benefit AND a challenge. If you are a recipient of a grant from a foundation, you will likely work closely with the people gifting the funds and are more susceptible to their opinions and ideas. Government grants are awarded at the federal, state, and local level. 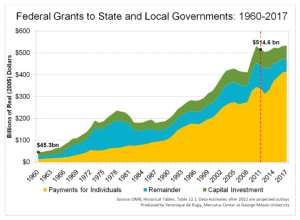 The federal government spends over $500 billion a year distributing grants to state and local governments. Government grants are usually awarded in larger amounts and are often gifted over multiple years. Government grants are more stable funding sources, and you can use these grants to make goals/plans for the long-term impact of your organization. Government grants can be a great way to scale and expand a program or service. The guidelines and requirements for government grants at any level are often more prescriptive and rigorous than foundation grants. Applications for government grants can be cumbersome and often require more information on your organization, track record of success and results, and strong systems in place. The competition for government grants is often high. There are usually more reporting and accounting requirements with government grants, which can be a challenging process to monitor. At Transform Consulting Group, we sit on both sides of the table. We work with the funders to develop, implement and manage funding programs AND grantees (or recipients) of those funding sources. We know looking for, writing, or applying for grants can become a daunting task so stayed tuned for future blogs with helpful tips for taking your next step. Many clients approach us with unique challenges or opportunities when we begin working together. Because we have worked with the funders and grantees, we are able to bring a holistic perspective and understanding to our clients regardless of what side of the table we sit. This often leads to meaningful engagement and collaboration – which we love! Is your organization ready to tackle a grant, but don’t have the manpower to work through the application? Are you wondering what grants are available for your specific cause? Contact us today! What’s your dream job? Does it entail having a flexible schedule and ability to work WHEREVER? That dream is not uncommon which is nudging more and more organizations towards allowing employees to work remotely. Recent statistics show 50% of the United States workforce holds a job that is compatible with at least partial telework and approximately 20-25% of the workforce teleworks at some frequency. 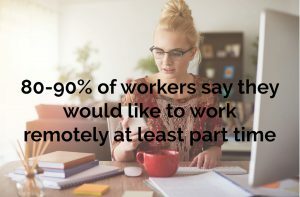 However, 80% to 90% of the workforce says they would like to telework at least part time. At Transform Consulting Group, our team gets the best of both worlds. Staff can work remotely or at the office. Since a lot of our work is meeting on-site with clients, we already found ourselves working outside the office. Staff enjoy collaborating when necessary, but also love the freedom of working at home. We see many benefits in this structure and we’re not the only ones! Employees who can choose to work remotely are more satisfied. 2/3 of people report that they WANT to work from home. 36 percent would choose the opportunity to work remote over a pay raise. Working remotely increases employee productivity. 30 percent of employees accomplish more in less time when working remotely. 23 percent are willing to work longer hours than they normally would on-site to accomplish more. 52 percent are less likely to take time off when working remotely. If a typical business allowed their employees to work remotely just half the time, they would save an average of $11,000 annually in reduced overhead. When your employees are happier, they stay in their positions longer. An average company loses $10,000-$30,000 for each employee who quits. Employees can also save money in reduced transportation and wardrobe costs. We use Google at TCG, so employees can access their email anywhere. There are many “cloud” storage systems. Our team uses Google Drive, and we highly recommend you have an external hard drive or server to regularly back-up files. We use Asana to assign tasks, track our team’s work and manage projects. This keeps everyone on the same page. 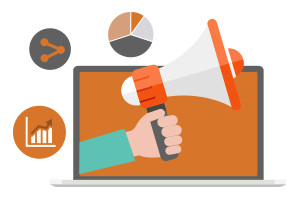 We use RingCentral for internal and external communications. At TCG, we utilize Harvest which is especially useful when allocating staff time for projects and billing purposes. While our team doesn’t regularly utilize the variety of resources available, we have used Go To Meeting; WebEx, etc. when corresponding with clients. Clear understanding of work schedules and when staff is “on” and “off” the clock, so the team knows when everyone is available. Have regular check-in calls and in-person meetings to review tasks and projects. While employees do enjoy the flexibility and freedom of working independently, they still want to feel connected to each other and the organization. Therefore, it is helpful to schedule in-person group activities whether it is annual, quarterly or monthly. 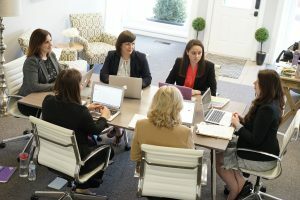 At Transform Consulting Group, we want to accelerate your impact and that often starts by creating an empowering work environment for OUR team so that we are better equipped to serve yours. For a full list of our services click here and let us know your thoughts or recommendations regarding working remotely! Disclaimer: This is not a sponsored post. We were not asked to highlight any of the listed resources and only share our own opinions. “Partner” and “collaborate” are the buzzwords in the non-profit sector. The idea of partnership is not limited to the individual organizations administering programming and services, but also applies to the funders awarding grants and funding. Af ter years of funders encouraging grantees to partner, they are taking their own advice and working collaboratively. Funding in the non-profit world can be siloed, with organizations often competing for limited funding for similar programs or services. At the same time many funders focus on similar issues and have a common desire to make a difference. An after-school youth tutoring program can easily apply to a dozen funders seeking resources for their program, because all of those funders have some interest in youth development and education. This means that after-school program is completing twelve separate grant applications that all request somewhat similar information in a slightly different package. Some funders are taking note of this trend and working collaboratively to support common causes. The idea that funders can make a bigger impact with their resources by working together rather than independently is enticing. In Central Indiana, this is exactly what has happened through the launching of the Summer Youth Program Fund. The Summer Youth Program Fund (SYPF) is a collaborative effort among funders who support organizations that provide summer programming for Marion County youth. The funding effort is made up of 11 funding partners (public and private) who support over 200 summer youth programs in Marion County. These individual funders have come together all with a common interest to support programs working with youth over the summer. Efficiency for the grantees. There is one application that the grantees complete to be considered for all funding opportunities. The grantees can spend more time on their programming and staff development and less time writing applications. Collective impact. Through a unified application, the funders have an opportunity to clarify and unite the intended focus, goals, and outcomes, which could lead to greater impact in the community. Improved programming. By working together, the funders could share capacity building resources made available to the grantees, such as combined professional development and technology. Accountability and monitoring. With a unified grant application and clear focus for the services, the evaluation, monitoring, and reporting is transparent and upfront. Common assessments and evaluation tools could be shared with grantees to implement. 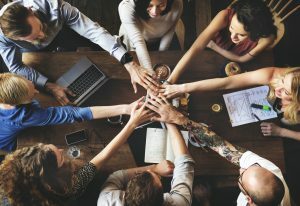 GrantCraft, a service of the Foundation Centers, has created a Guide on Funder Collaboratives: Why and How Funders Work Together. There are some great strategies and resources to help guide the process. 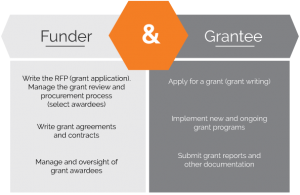 We have worked with funders to develop and manage their grantmaking process. If you would like to talk about enhancing your current grantmaking program or exploring a funder collaborative, give us a call or send us an email! We would love to help you think through the process and see how we can improve your impact. Is Your Non-profit a Cooperator or a Competitor? With the continued growth of non-profits over the past several years (as we recently discussed in this blog article), some organizations view themselves in competition with other community organizations. While this might not be the intention of Executive Directors or board members, often non-profits are competing for funding, clients, and even volunteers. However, a new trend is starting to emerge where non-profits are cooperating in partnership and not competing. Our office is doing a book club, and the current book that we are reading is Forces for Good: The Six Practices of High-Impact Nonprofits by Leslie Crutchfield and Heather McLeod Grant. In their research of exemplary non-profits across the nation, they identified six effective practices identified in all twelve high-performing non-profits. One of the six effective practices identified is the importance of nurturing the non-profit networks. All twelve exemplary organizations were not just focused on making their non-profit the best, but working to build formal and informal non-profit networks to advance their mission and cause. Some might think that this is contrary to what makes a high-performing non-profit (to focus externally instead of internally). Grow the pie – Funders are very interested and supportive of joint partnerships for programming and services. Focus on expanding funding for the greater cause over your individual organization in order to achieve greater impact for the cause. This can be done through joint grant applications, redistributing funds to other organizations, or partnering with other non-profits in their fundraising efforts. High-impact non-profits will often serve as the “backbone” fiscal support for the network. Share knowledge – Consider other non-profits as allies and share your expertise, research, etc. to strengthen the system. In looking toward a collective impact model, having a network that is consistent with related knowledge only helps further the cause. Develop leadership – Often non-profits have one leader that holds all of the knowledge, including historical knowledge of trends and partnerships. It is essential to cultivate the leadership of the next generation across the network. Again, this strengthens the cause by increasing the capabilities of the workforce. Work in coalitions – Often the causes that non-profits are working to address are complex and multi-faceted. Once a non-profit network is established, the next step is to broaden the network. It takes a unified community to make change happen and to sustain its impact. There is no question that leading a non-profit organization is a challenge, and the concept of developing a network of non-profits might seem too hard to conceptualize. Building a strong network of non-profits to collaborate with is a great strategy to expand the social impact of your cause. 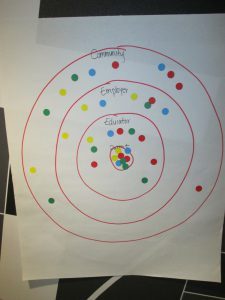 Looking to other non-profits as allies in the overarching goal of improving the community and offering your strengths to them will create a unified, cohesive network that together can mobilize the entire community and sustain a greater impact. At Transform Consulting Group, we work with many non-profits on program development, which often includes an emphasis on cultivating partnerships with local organizations. If you are interested in learning more about cultivating partnerships and the collective impact model, contact us today for a free consultation! In today’s information age, organizations are overwhelmed with the amount of information that they collect, track and monitor. Non-profit leaders must decipher through all the data to determine what is meaningful and relevant to share with staff, funders, Board of Directors and other community partners. A dashboard is a great tool to bring all the critical elements together in a user-friendly report. Determine the audience for the dashboard. A dashboard is customized for the audience meant to view and use the dashboard, so first an organization needs to determine the intended audience. Then an organization needs to determine the key takeaways that you want the targeted audience to get from this dashboard. Lastly, the organization should really focus on the information that is most important and relevant for this audience. Decide on what the dashboard is tracking now that the audience is determined. A dashboard is meant to communicate progress over time, such as monthly, quarterly or annually. In addition, data in the dashboard can be used to compare different data sets, such as geographic locations, sites or populations. These factors need to be determined to provide the appropriate context for decision makers. Determine the visuals that will be most effective in communicating the message. In most cases, we work to fit a dashboard on one-page. This does not provide much “real estate”, so you must be intentional about the visuals used to grab the audience’s attention and display the key messages [Sidebar: this is why we use Tableau!]. A dashboard does not have much room for wording and explanation. Determine the delivery of the dashboard. In most cases, dashboards are “static” or print reports that are shared via handouts or electronically. However, with the growing development of software programs more interactive dashboards are being created. In some cases, there may be value in creating both a static dashboard that is completed annually and an interactive dashboard that is updated real-time. children, ELAC realized that the amount of data and information was overwhelming. 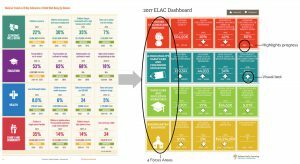 ELAC was inspired by the Annie E. Casey Foundation’s 16 indicator dashboard in their annual data book and used this to create ELAC’s dashboard. Identifies four focus areas related to children and families, high-quality care programs, education workforce, and kindergarten readiness with 16 key indicators. Uses arrows (a visual tool) to depict if the numbers represent improvement (arrow goes up) or worsening (arrow goes down). 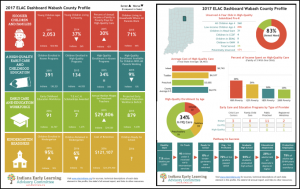 After a few years of creating the ELAC state dashboard, communities across the state of Indiana were asking for this same data at the local level. We worked with ELAC and our state data partners to gather the county level information to create a two-page county dashboard and profile. The first page of the county profile mirrors the state dashboard with a few exceptions. Instead of comparing progress over time, the county dashboards compare the county data to the state data. Following steps #1 and #2 above, we focused on the audience for the county dashboards who said that having their data in the context of the state data would be helpful to know if they are doing better or worse. Therefore, that ranked as a higher priority than comparing their data over time. The second page of the ELAC county dashboard was new and provided the opportunity to add visuals (charts and graphs) to dep ict the key findings in the full narrative report. The visuals help to communicate complex information in simple charts. Using a data visualization software program like Tableau is critical to not only help make the dashboards visually appealing but also to automate the process. In this case, we created 93 unique dashboards for the state and all 92 counties. While the ELAC dashboards are currently only static reports, there is the option and feature (with Tableau) of making them interactive like the Indiana Commission of Higher Education’s College Readiness Dashboard. One of our good friends, the M.A. Rooney Foundation, has also been working to transpose K-12 data for schools and community partners into meaningful dashboards. Are you ready to get started in creating a dashboard for your organization? We would love to work with you to help you focus in on the key indicators important for your organization and create a dashboard that informs decision-making! Contact us today for help.